There we were, my dog and I, strolling down the neighborhood bike path. Minding our own business. Then out of nowhere, whoosh! A pair of border collies flies by, followed by a guy on a pair of Nordic skis. We ran into the kid and his dogs in a nearby parking lot, and got to chatting. Apparently, letting one’s dogs tow them is actually “thing,” with clubs and racing events. Joring is the Scandinavian word for “driving” or “pulling”, as it relates to draft dogs and horses, and for the past decade, it’s become a growing sport here in North America. Less than six months later, my dog Jobi and I were hooked, and I’ve become that annoying person who’s trying to get her friends (and complete strangers) on the skijoring bandwagon. Is Your Dog Up For It? Photo from Denali National Park and Preserve (© 2013 Some rights reserved). If your dog loves to run, is quick to pick up new commands, and is at least 35 pounds (50 and up is better), she’s probably a great candidate for joring sports. Do you have two dogs with similar builds? Three? You can even run a team. This list won’t necessarily exclude your dog if she doesn’t meet all the criteria; they’re just helpful to determine whether a dog will handle most winter conditions and have the mindset needed for pulling in open areas. Thin-coated breeds shouldn’t be ruled out if they have the right harness. Mine’s a Weimaraner cross; she’s super fast, she’s game, and so far we haven’t had any problems with her skin. The first rule of choosing Nordic (a.k.a. cross-country, or just XC) skis for dog skijoring? NO metal edges. If you and your dogs get tangled up, they could get hurt. Having said that, most skijoring fans use waxless classic-style skis, while others choose backcountry-style skis. Skate-style cross-country XC skis will do if you stay on groomed surfaces, but chances are you’ll want to get into the “crud” now and again. I did a lot of research before I purchased my first XC skis for skijoring. Have you heard the phrase, “ask five experts what setup they’d recommend, and you’ll get ten different answers?” That’s the truth. I happen to like the way this person answered the question on a forum; I’d likely respond in a similar fashion now that I have some experience. If you want a little more detail, Hughie’s post on the It’s a Husky Thing forum lays it out quite nicely. If you’re new to XC sports, I recommend going to a reputable ski shop to get the right skis, boots, and bindings. A professional dealer will help you choose the best, most versatile package for your budget, and get everything set up for you. But before you go, brush up on the basic terminology and gear types so you’ll be prepared to make an informed decision. 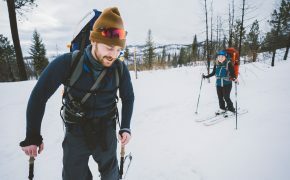 Backcountry.com has an excellent overview of XC skis, bindings, and boots. The package is well-made, but the biggest drawback is cost. Ruffwear’s MSRP puts it at $169.75, and while I really like the company’s products—and think that the system is, overall, great—most skijoring fans end up purchasing equipment a la carte, and saving a lot of kibble. If you go to a skijoring event, you’ll mostly see classic “x back” harnesses designed specifically for sled dogs. These are almost always around $30, and Alpine Outfitters is a popular retailer that custom-makes them at that price point. 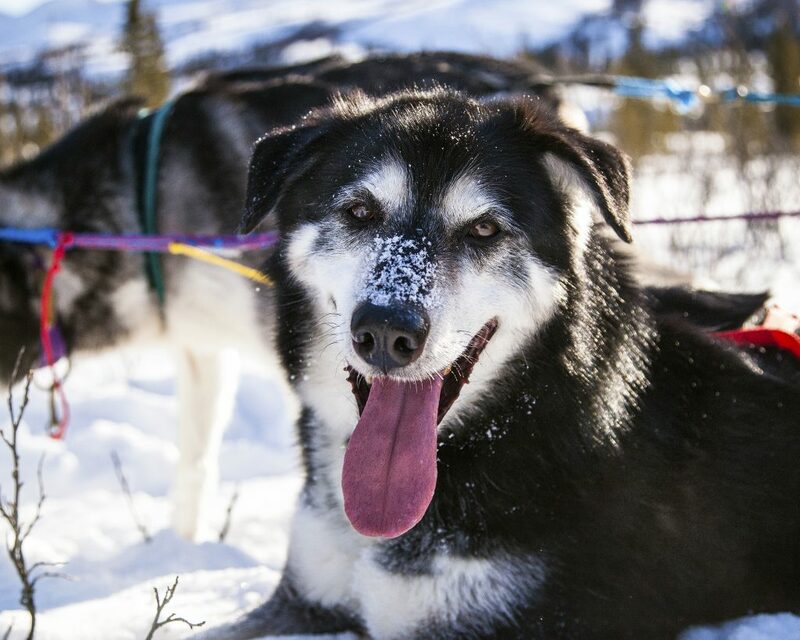 Dogs come in all shapes, weights, and sizes, so you should take advantage of skijoring companies that offer custom harnesses fit to your dog’s specific measurements. Never let your dog pull you by a collar, since it puts too much pressure on the neck vertebrae and restricts breathing. It can seriously damage your dog’s trachea. Dog walking harnesses are a poor choice, too, since they’re really not built for active pulling. Imagine your dog taking off while you’re at a standstill. Whiplash, anyone? Skijoring towlines are made with elastic to absorb shock. 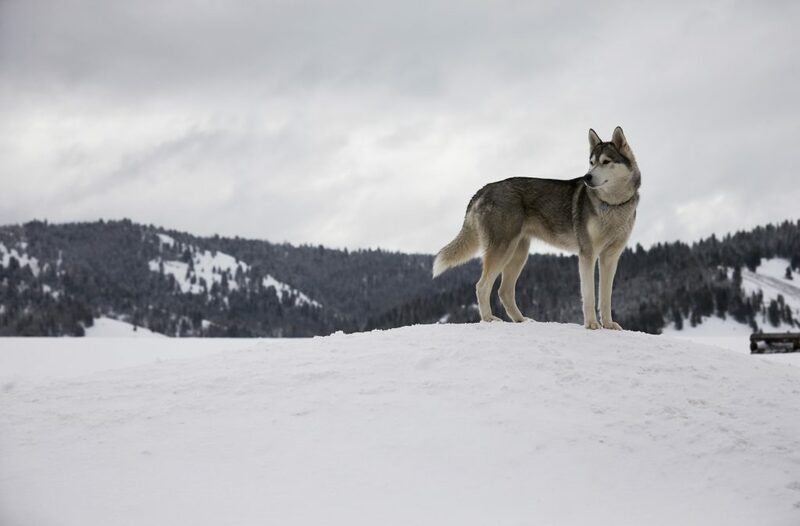 Choose one that maxes out at between 8-10 feet to accommodate your skis, and give you plenty of stopping distance between you and your pooch. Towlines generally run around $30. If you’re running two dogs, you’ll find gear to connect their harnesses to one another so they can run abreast, or in tandem. Harnesses are all about your dog’s comfort; a wide, padded hip belt is about yours. You’ll wear it around your hips rather than your waist to prevent damage to your lower back. If you order one online, measure accordingly, and be sure to account for your winter clothing. Treat pouches and water bottle holsters are always a plus, as are loops to which you can attach small gear bags. I happen to love the Ultra Paws belt; note the hot pink quick release loop for detaching from your towline in an emergency. This one costs about $75, which is roughly the going price for high-quality skijoring hip belts. Do you have a rock climbing harness? These work in a pinch. Dog joring can be a year-round sport! I haven’t tried using wheeled carts, trikes, or scooters, but I have a friend who hooks her dogs up to her mountain bike; this is called bikejoring. “Urban mushing” is the general term most often used for warm-weather joring sports. And, of course, there’s skatejoring. Grab a longboard and head out to terrorize strip mall shoppers on any given summer afternoon. If you’re not into XC skis, kicksleds are intended to be rider-powered, but your dog can do most of the work if you use the right attachment equipment. The harnesses used for bikejoring—they hook up to the handlebars—work well, or you can have your kicksled retailer suggest the right rig. One major bonus of kicksledding is the ability to bring along a small passenger. Just be sure they wear a helmet! Yep, you need clothes. Naked skijoring can get pretty cold. Choosing the right clothing is important, since you’ll be physically active with periods of rest. 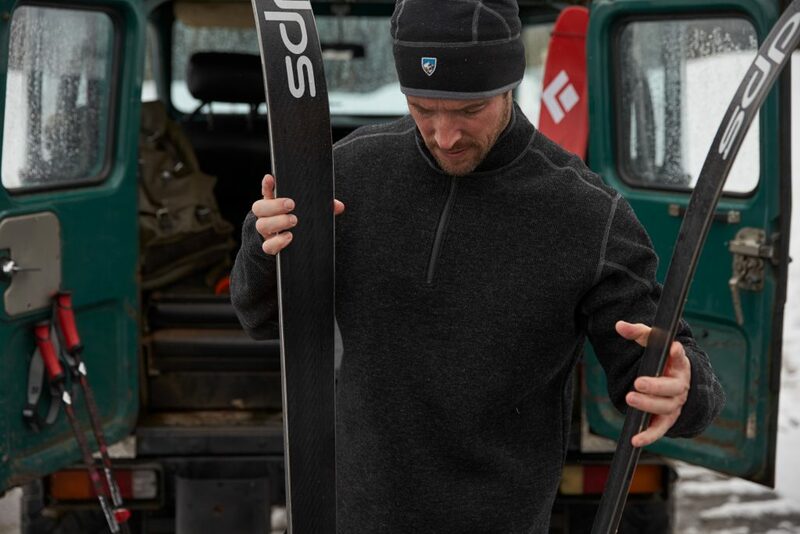 Wear a high-quality base layer, a merino wool or fleece sweater, and a warm coat. I like wearing waterproof, breathable pants, and I keep a shell in a lightweight backpack in case I need it. On the coldest days, of course, I’ll wear a down parka. I’ll throw in a warm wool or fleece hat, high-quality UV-protection glasses, leg gaiters and a neck gaiter. I never wear long scarves, as these can snag on tree branches and cause some serious hurt. A good pair of thin, insulated gloves are a must so I can quickly release the tug line in an emergency, but I carry heavier gloves just in case. You’ll have to have a little patience and a lot of dog treats to get your dog up to speed with voice commands. I watched a few videos on YouTube, since I’m a visual learner, and quite frankly I was shocked by how quickly Jobi got the hang of it. The key is to use clicker training and positive reinforcement, and to begin training on dry land before you hook your dog up to his or her harness. As for the harness training itself, get the dog used to the equipment before you begin teaching commands, then let your dog wear the harness during your training sessions. Dogs love to work, and they’ll quickly associate the harness with “happy fun worky sleddy time,” as I call it. It’s also important not to each your dog the “line out” command unless she’s wearing her working gear; otherwise, you’re teaching her to pull any time she’s on a leash. Directional Training: (Video) Gee means left; haw means right. (In some countries, it’s reversed). This is one way to teach your dog directional commands. Directional Training “Figure Eight” Style: (Video) The All Dogs are Smart YouTube channel has some great training techniques. I like to combine different directional cue exercises so the dogs better understand the concepts of different cues regardless of the context. I would have had an easier start in the sport if I’d sought hands-on advice and mentorship from an experienced skijoring enthusiast. I’ve met some great people and learned a lot hanging around on the sidelines at events, and if you can check one out before you jump in, you might get some good advice to get you started. Look for teams with dogs similar to yours for advice on harnesses, and find out what skis are best for the trails in your area. At the very least, you’ll have a great time. Dogs get really excited when they know they’re going to get to run (and run and run and run!) and there’s usually someone selling hot chocolate. That alone could have been the selling point for me. If you don’t have any local skijoring clubs, look into a dog agility club. This is especially helpful if you’re training off-season and want to brush up on socialization and directional cues. 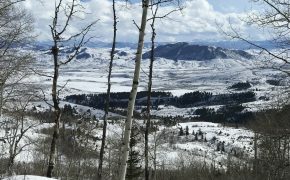 Rocky Mountain Sled Dog Club: Serving Colorado and surrounding states, but there are members from all over, from Utah to Ontario and east to West Virginia. Great list of upcoming events countrywide. I don’t know what it is about dog skijoring and sledding websites. They look like they were built in 1996 and never updated since, but the information’s current and definitely still valid. I guess everyone would rather be out playing with their dogs than sitting in front of a computer in their spare time. My kind of people! 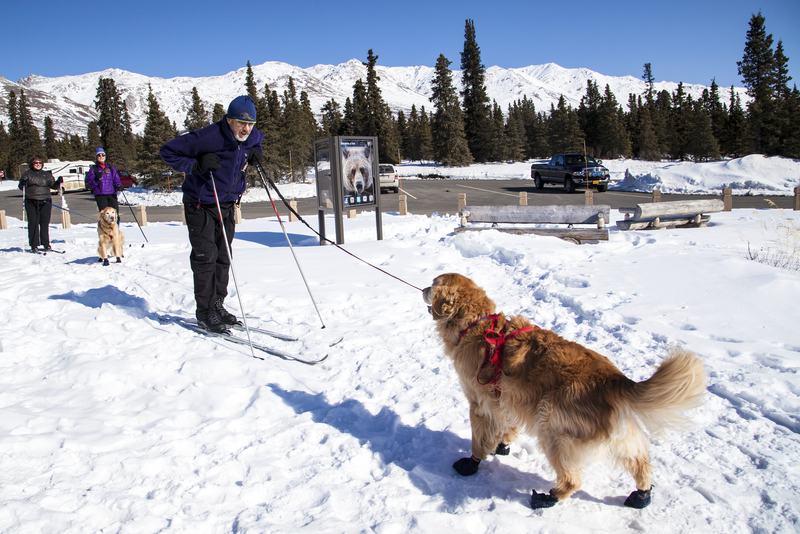 More and more park systems are welcoming dog joring sports. Minnesota’s Three Rivers Park District is a great example. Nordic ski parks are beginning to open trails to dog skijoring, though you’ll want to call ahead to be sure. 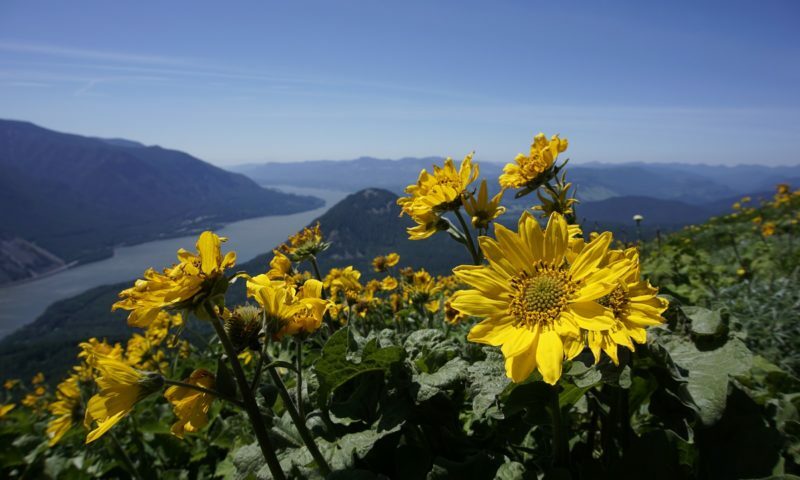 Be sure to ask if there are dates or trails off-limits to dogs. 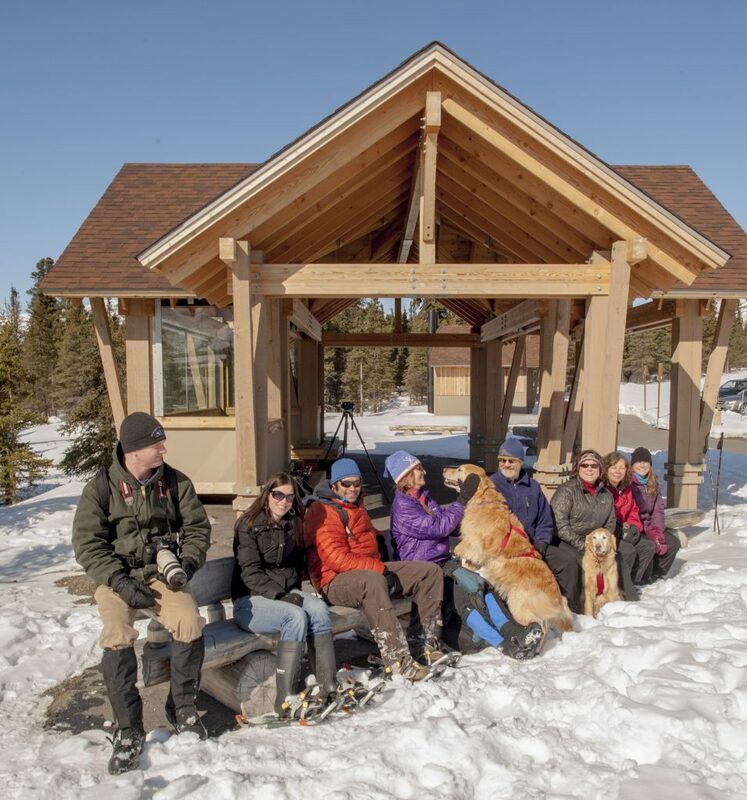 A great place to look for groomed trails is the Cross Country Ski Area Association, which lists all their member resorts by state. Dog joring sports really do tighten our bonds with our pets, and give them a new purpose. Just like us, dogs get cabin fever during the winter. We can always make excuses to stay inside and be couch potatoes, but when our dogs are giving us that look, we’re more likely to get out, burn off some energy (and calories) and have fun. And you never know: you could inspire someone else to pick up the sport as you whoosh by them on the trail. Featured image from Denali National Park and Preserve (© 2013 Some rights reserved).